I met up with some friends I hadn't seen in a couple of years at the hotel bar at the Westin at the Domain. The Westin has a restaurant, Urban, that I haven't tried yet, but will get to eventually. This is not a review of Urban, but of the Urban Lounge. We were at the bar for about 90 minutes when some food service workers from another restaurant at the Domain came in and sat at the bar. About 20 minutes after they arrived some wonderful smelling pizzas came out. I'd had a small dinner, got hungry without realizing it, and those pizzas were smelling like they would be the cure for my hunger. The bartender pointed us to the bar menu and saw the pepperoni and sausage pizza for $6. We ordered one to share for the four of us. The pizza came out and it tasted as good as it smelled. The crust was crispy on the edges, there was a generous amount of cheese, and the pepperoni was tasty. The sausage was not like regular "Italian" style sausage it was chopped up link sausage. It had a mild non-BBQy flavor and was very good. The change-up in sausage was appreciated. The pizza was very light on the sauce. I really like sauces and condiments so this could have been an issue, but the light sauce worked on this style of pizza. We all really enjoyed the pizza and will definitely be back for a late night bite, definitely better than any of the 6th street pizzas. 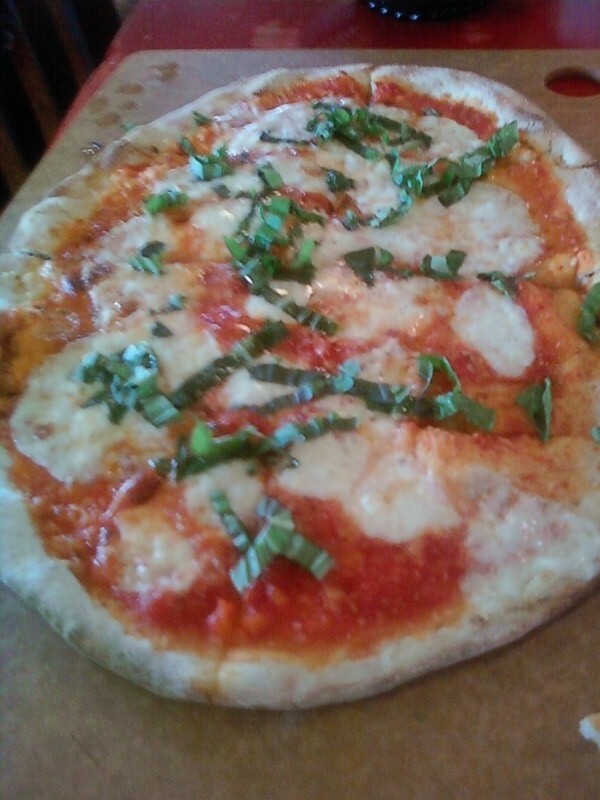 The pizza isn't going to outdo Homeslice, Reale's, Craig O's, or NoRTH, but it's really good for bar food. Also a great deal price-wise considering the bar has typical hotel bar pricing ($4.50 domestic beers). Close up view, picture ended up dark. I visited with two friends on a Monday evening. We had to make reservations because the restaurant is always full – if you decide you want to try La Condesa – make a reservation! Two of us arrived early and visited the bar where I ordered a Margarita Classico, which was delicious, but small for the $8 price tag. My friend ordered a Shiner which was $5. Kind of ridiculous in Texas. When we were seated we decided to start out with a bunch of the smaller plates. We ordered chips and salsa ($4!) which came with four small salsas ranging from chipotle mild to habanero hot.We decided to try the crab and apple guacamole which was $8 (most guacamoles are $6 but the one with crab had a $2 upcharge). The taste was amazing, the amount (of crab and the overall amount of guacamole) was lacking. I assumed it would be a giant molcajete full but it was just a small cup. 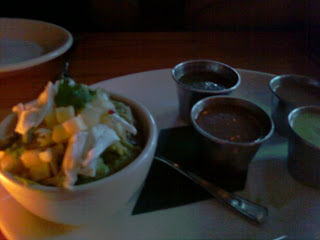 The crab was fresh and the texture of the apple in the guacamole was nice. Next we decided to try a huarache. We chose the Panza de Puerco (pork belly - $14). It was pretty small – not at all what I am used to when ordering huaraches especially considering it’s called a huarache because of the dish’s resemblance to a shoe. This would’ve been a shoe for a young person with extremely narrow feet. The pork belly itself was amazing. It melted in your mouth as pork belly should. Sadly, the masa base was tough and oily. 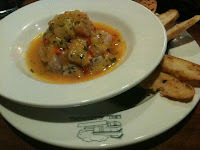 We then ordered the Hamachi ceviche, priced at $16. It was beautiful and came in a broth of different citrus juices. The flavor was bright and refreshing and was served with grapefruit sections, avocado, and chicharron to add a nice surprising crunch. This was a dish I wished there was more of. As our main dish we decide to share two sides and an entrée. We chose the chile relleno ($20) because 1) it was $12 less than the short rib and 2) the combination of manchego and butternut squash sounded delicious. Unfortunately, it did not live up to our expectations. One friend inconspicuously spit out her share while the other friend and I nibbled on it trying to figure out what the odd taste was. I couldn’t taste any of the squash or manchego. It’s possible that it was an off night, but I wouldn’t order this dish again to find out. The Mexican Elote was good and they offered to cut it in half for two of us to share. The platanos were delicious – they were topped with the avocado tomatillo salsa and some queso fresco but even without, the flavor of the plantains alone would have satisfied us. They were probably the best thing I had there all night. For dessert we tried one of the house made ice creams ($2). We chose the banana brown sugar which tasted just like banana nut bread. It was accompanied by a Mexican wedding cookie. The décor in La Condesa is beautiful. The patio would be a great place to enjoy dinner when the weather cools down. The chips were warm which is a plus and my margarita was delicious. I also did not order an entrée with meat so it’s possible that I would have enjoyed that better. The restaurant was HOT - it had to have been about 85 degrees inside. We had pretty poor service, so maybe our waitress had too many tables. We saw her walking past us a lot, she just rarely stopped to check in. The restaurant was also very dark (that’s why there are not more pictures) - possibly to try and counteract the heat and even more likely to help hide politicians who were out with their non-wives. The restroom situation is odd. It’s upstairs (just a small flight) which is fine for me, but I just thought about older or handicapped patrons who don’t do well with stairs. There is a small elevator right next to the entrance which I feel would be 1) difficult to use and 2) very attention grabbing and possibly embarrassing. Overall, it was a very disappointing experience. Would I return? Yes, if someone were paying for my meal. So, if anyone wants to take me just let me know. Everyone knows I love seasonal items and now it's Hatch Green Chile festival time! Right now at Central Market you can get everything from Hatch Macaroni and Cheese to Hatch Green Chile Apple Pie (a friend swears it's good). Chuy's also does a Hatch Green Chile themed menu and this year I noticed they added some new items. My favorite is the Hatch infused Mexican martini but I am pretty sure that is available year round. Has anyone tried this yet- or heard anything about it? I think it may be my dinner tonight. So I stopped at the local store post work out to pick up a protein shake and found one of my favorite candies. I have to say there are many like them...Sour Straws, Sour tapes, etc. I cant even give a brand name but they are usually packaged very generically in a sandwich bag in groups of five or six. You can see from the picture they just look like a bag of drugs....not that I would know. They usually sit by the register in a clear tupperware like container that has no label. Ok enough of that they are the best of their kind. 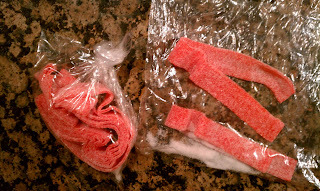 Not too tart and they dont stick to your teeth the way sour punch straws do. They are a little addicting I can never eat just one. I'm aware I havent posted in a while but I really thought I'd mention these since usually I'm pretty loyal to my proteins. I enjoy watching America's Test Kitchen and Cook's Country. They tend to make meals that are appealing and the recipes are very easy to follow as they've done a lot of testing (in the Test Kitchen) to make sure the food turns out great. This was a pretty simple recipe, but I had been scared of doing chicken on my grill so they gave me the confidence to give it a try without fear of overcooking it. This is the Cook's Country "Classic BBQ Chicken on a Gas Grill" recipe. You have to have an account to view it (lame, I know), but I don't think you have to pay for it. I didn't make my own BBQ sauce like they do in the recipe, I used their store bought substitute, Bullseye and it was good. I bought one bone-in breast and leg quarter from Sun Harvest, and paired it with some grilled yellow squash and zucchini. I think it turned out very good (this is the second try, I was more liberal with the seasonings this time). One concern is getting a good amount of flavor from the breast. I don't want to slice into the meat to put rub in it for fear of it drying out, but the meat at the thickest part ends up tasting very plain. I guess that is what sauce is for then? Any suggestions on how to add more flavor to the breast meat? Recipe from Cook's Country, "Classic BBQ Chicken on a Gas Grill". Be sure to rub the seasonings over and under the skin for the best flavor. Squash and zucchini prepared with olive oil, kosher salt, and McCormick brand Hot Shot pepper blend. In my last post I discussed the Austin "big burger" scene and pronounced Hopdoddy to be tops in town. Even though Hopdoddy is very far from where I live it's good enough that I agreed to go one weekend afternoon with the wife (and I try not to go anywhere on weekend afternoons). Hopdoddy has 11 different burgers to choose from, but I don't find any of the specialty burgers to be quite right so I always go for a "Classic burger" - Beef, Red Leaf Lettuce, White Onion, Ripe Beef Steak Tomato with mayo and mustard (taken directly from their menu). One thing I loved about Hopdoddy right off the bat was the default inclusion of mayo and mustard on the burger, exactly like I make at home. I knew I wouldn't be waiting another 15 minutes after I got my burger because the waitress didn't remember my side condiments. Firstly, the Hopdoddy bun, which they make in house, is a thing of beauty. I don't care for hamburger buns very much. I grew up eating burgers on plain wheat bread and have always found that better than cheap white buns most places offer, or even the sickeningly sweet Sheila Parlin buns from the dreadful Phil's Icehouse. Hopdoddy buns aren't sweet or spongy, and have the right amount of wheaty sweetness to not overpower the whole burger. They arrive with that perfect sheen from the griddle that says "I will be tasty". The beef is well seasoned and not so thick that the middle part of the patty is tasteless. The tomatoes are juicy and the onions add a nice crunchy sweetness. Luckily for people like me who hate dry foods there is plenty of extra mayo and mustard available at the table. I'm not a potato guy, but their fries are good enough that I'll order them, and I don't always order fries. I'm sorry, but that's my only fry criteria. My wife ordered the Classic Burger with cheddar cheese and hers was the superior burger (and the picture of hers shows better evidence of caramelization from the flat top). This is not a problem not relegated to Hopdoddy, but to all burger places. Ordering a burger with pepper jack is a losing bet right from the start. No place puts on a thick enough slice of pepper jack in order to get enough of the pepper jack flavor, and unlike cheddar, jack cheese isn't salty enough to add flavor to the burger on its own. I'll be sticking to cheddar when eating out from now on, and saving pepper jack for home. Hopdoddy has a strange seating set up where you get in line, then are given a table number based on how many are in your party. You have to remember the table number (which you get before you order), and then search the restaurant for the correct table (huh?). I have not had a problem with it, but I could see that it might rub some people the wrong way. They must have a reason behind this style of seating, but I would think there's an easier, workable method of seating. Now that I have declared Hopdoddy Austin's best "Big Burger", I eagerly await an opening of a Hopdoddy in NW (Arboretum) area Austin so that I can go more often. Thanks to another dining coupon, this time Living Social, I was finally motivated to try El Arbol in central Austin. I had heard mixed reviews about this place, but when the coupon was sent earlier this year I figured it would be a good way to try El Arbol out without spending too much money. I went with two friends who I personally love eating out with. They are up for trying new things and are wonderful conversationalists. One provided the pictures for this review since my phone is old and the pictures I was taking came out too dark. We decided to begin with the Pulpo a la parrilla: oak grilled octopus, charred fennel, roasted potato, salmorra. I am not a fan of octopus having tasted it at a sushi restaurant and chewing, chewing, chewing until...it was still in it's tentacle shape. This night we decided to try it for two reasons: 1) it was made on this week's MasterChef finale and got rave reviews from the judges, and 2) it was only $8. 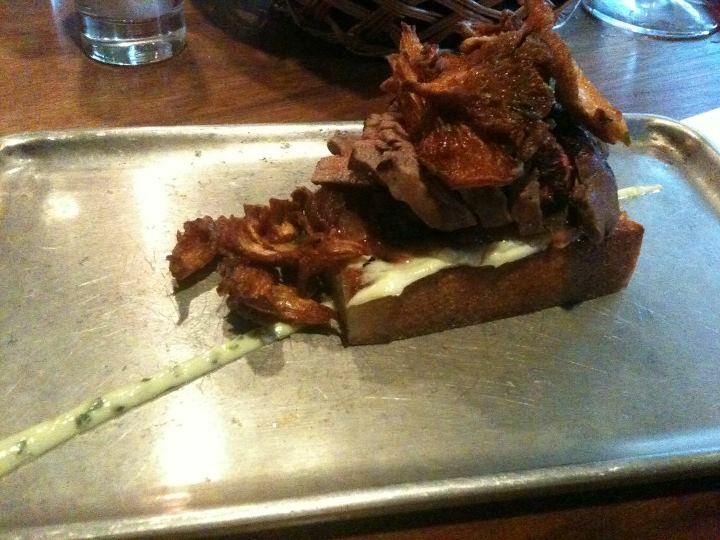 The dish was plated beautifully. 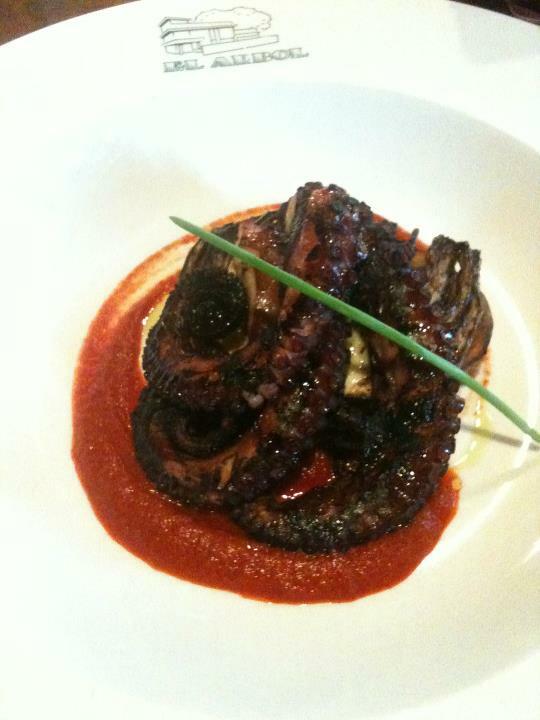 The octopus was not near as chewy as we expected and had a good flavor from the grill. The salmorra (a tomato and garlic puree) was tasty and we mopped it up the provided bread. Next we tried the Bruschetta de Bife: oak grilled rare tenderloin, caramelized red onion, charred tomatoes, fried king oyster mushrooms, and aioli on toasted bread. I wish I had ordered this all on my own and didn't have to share. Everything melded perfectly. The tenderloin melted in my mouth. The mushrooms had an almost vinegary flavor which I loved. This was by far my favorite dish of the evening. The third appetizer we tried was the Ceviche de Criollo - gulf snapper cured in citrus, with tomato, garlic, red onion and crostini. The fish was extremely fresh. The color on this was amazing - so vibrant. I believe this dish also had some bell peppers (I am not a fan) but I still enjoyed this. It was light and flavorful. 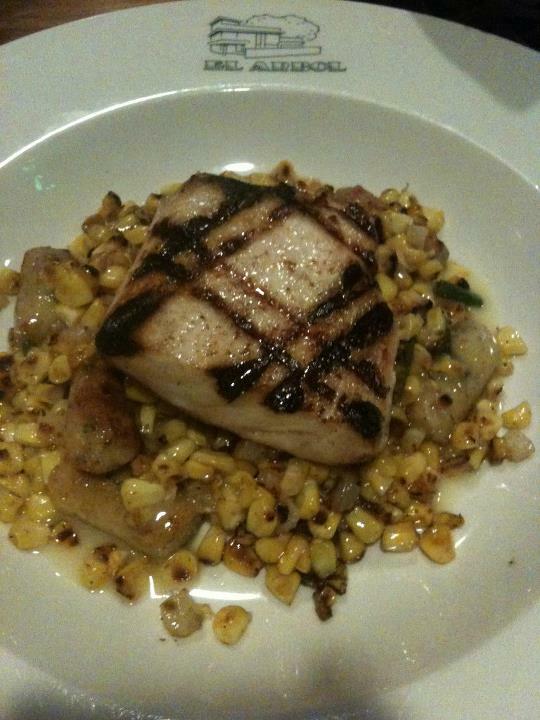 We decided to share one dish from the grill and settled on the grilled escolar on top of roasted corn and herbed manchego gnocchi. The fish was light and moist. There was probably too much corn on the plate and the only reason that bothered me was because I wish instead of corn, there had been more of the gnocchi. They were browned on the outside and light and pillowy in the middle. As our side, I convinced my friends to get the Repollitos de Bruselas: fried brussel sprouts with lemon juice and aioli. I recently discovered how much I love brussel sprouts so I have been trying to order them at different restaurants that offer them. These were so tasty - my mouth is watering now as I write. 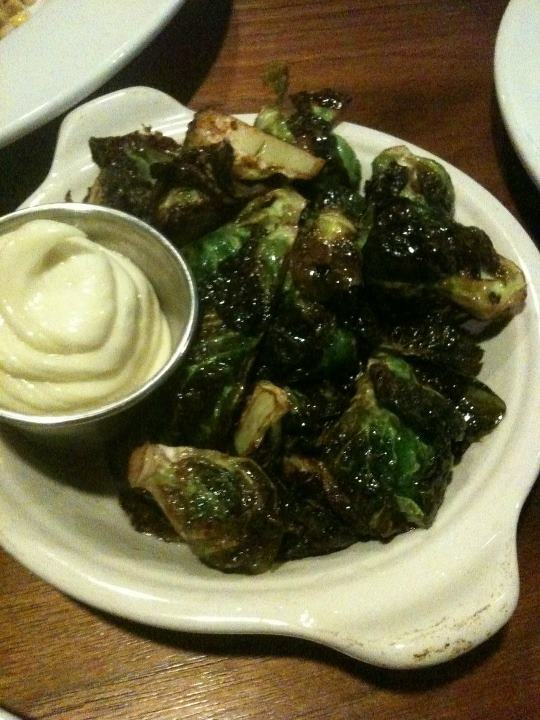 The tartness of the lemon juice and the deep flavor of the caramelized brussel sprouts was a perfect combination. I was happy one that one of my friends doesn't like brussel sprouts because this meant I got to eat more. Finally, it was time for dessert. We chose the Bacon-Brioche which consisted of bacon gelato, brioche bread pudding, poached raisins, walnut streusel, bruleed bananas and whiskey vanilla sauce. I wasn't that impressed with the bread pudding. The gelato was good and had a nice salty finish. I could have had a bowl of just the gelato with the bananas and walnuts. The bread pudding looked like a hard piece of flan and seemed like a traditional piece of bread pudding put into a pressure chamber to make a perfect block. The flavor was good, the consistency was not what we expected. Other things to note - this restaurant is beautiful. There are three levels. I cannot wait for the weather to cool down so I can go enjoy a drink on the upstairs patio. Speaking of drinks, they are a little pricey so I recommend taking advantage of the happy hour specials. Overall this was an amazing dining experience and I recommend giving El Arbol a visit. The search for a good burger in Austin is never ending. Yes, there are the always dependable old-fashioned greasy flat top burgers from Dan/Frans and Sandys, but Austin has no go-to big, tasty, juicy, and cravable burger like Chris Madrid's in San Antonio. Austin was once home to some really great burgers at places like The G/M Steakhouse on the Drag and Mad Dog and Beans in West Campus. Unfortunately both closed in the mid-90s before I could fully appreciate them (I ate at GM three times and Mad Dog and Beans twice). 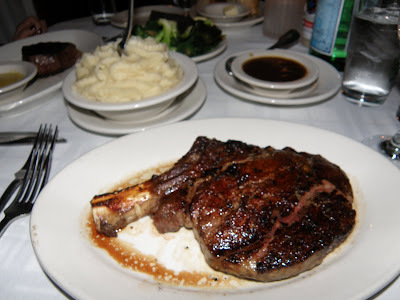 I still miss G/M Steakhouse to this day. Some people might point you to the perennial Austin Chronicle "Best Burger" winner Huts, but those people are dead wrong. My burger at Hut's tasted like it was full of lighter fluid. Clearly overrated and just plain bad food overall. Its Austin Chronicle wins are inexplicable (unless the explanation is that people in Austin keep voting for the same old shtuff year after year). The other burgers many would point you to are over-rated burgers at Casino El Camino. Food Network and word of mouth built up the mystique of an unwelcoming atmosphere and rude counter help to mythical proportions. The burgers were built up just as much, but what you got was a half pound lump of tasteless meat who's only flavor was char and whatever else was on the burger (bleu cheese and buffalo sauce were popular choices). Casino El Camino goes down as another over-hyped Austin eatery. Here's the good news, within the last year a new restaurant has opened that, while not reaching a Chris Madrid level of food enjoyment, is pretty damn good and definitely holds the top spot for Austin. In my next post I'll review this new(ish) place, Hopdoddy Burger Bar. Can you give me a Han? I'm trying to wrap up the 2010-2011 TV season's Han Solo sightings, so here is one of the last ones I noticed. 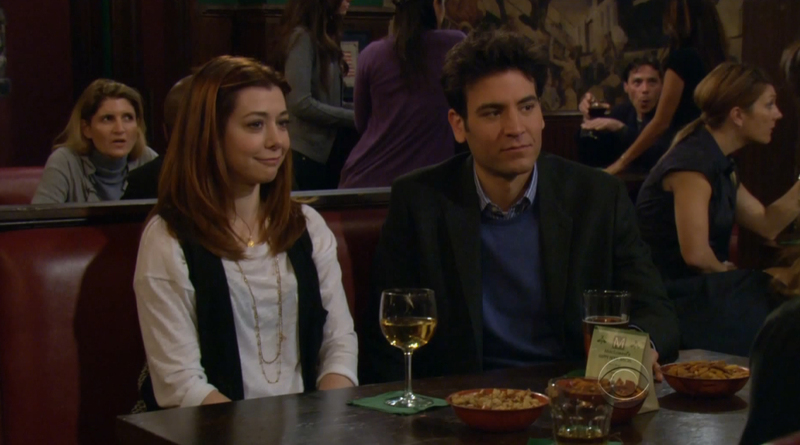 Lily from How I Met Your Mother dons the Han Solo vest for one of the last few episodes of the season. 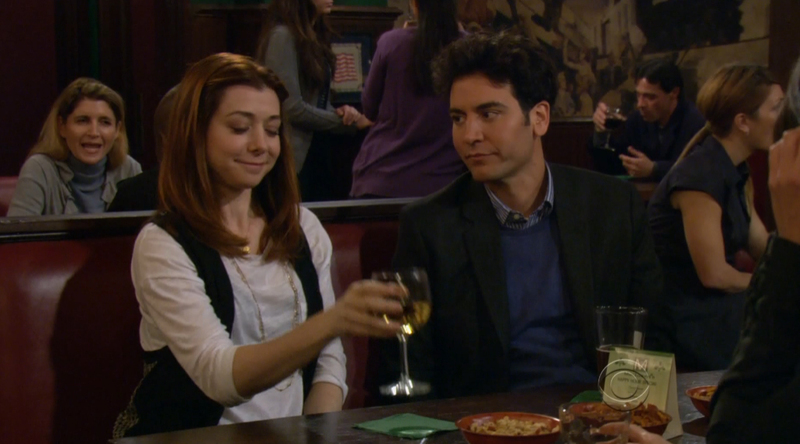 In a bar, at a booth, maybe Lily shoots first? 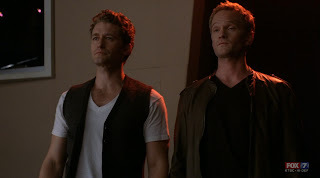 While this was from 2009-2010, I'm adding this here because this season Glee fully embraced Will Schuester's vests with Santana telling him he need to be in a 12 step program for his vest addiction. 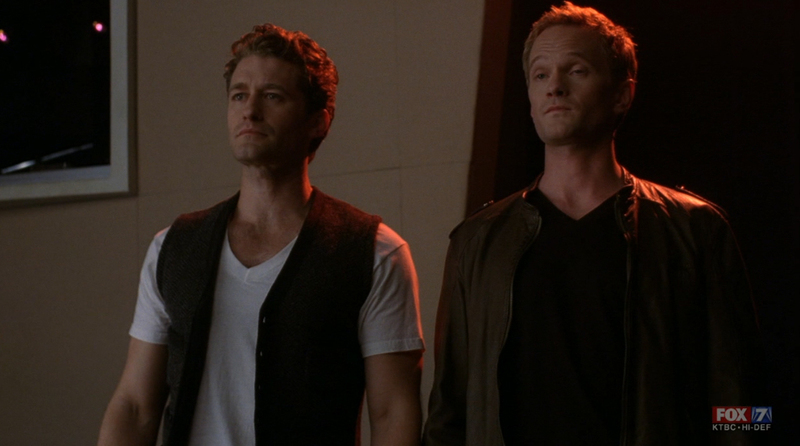 Also because it's Will Schuester with Barney from HIMYM. My wife and I love a big breakfast on the weekends (see homemade biscuit sandwich above). We frequently make many incredible meals including over easy eggs, scrambled eggs, omelets, sausage, bacon, avocado, cheese, biscuits, and/or pancakes (not necessarily all at once). After realizing that the biscuits at Cafe Java were so good because they split them and toasted them on the griddle with a little butter we began doing the same thing, and it made our biscuits even better. A couple of months ago I was feeling just a little too healthy and decided to experiment with a biscuit, some cheese, and our comal. What resulted was the creation of the cheesy biscuit. The comal was already hot after toasting the biscuits, so I added some shredded cheese. Then I placed the biscuit half on top of the cheese. After letting the cheese melt a bit I used a spatula to push the cheese closer to the biscuit. Then I used the spatula to scrape it off the comal and onto my plate. A cheesy biscuit with some hardened "baked" cheese. Ready for bacon and eggs. This whole process doesn't take any longer than 90 seconds, and the result was delicious. 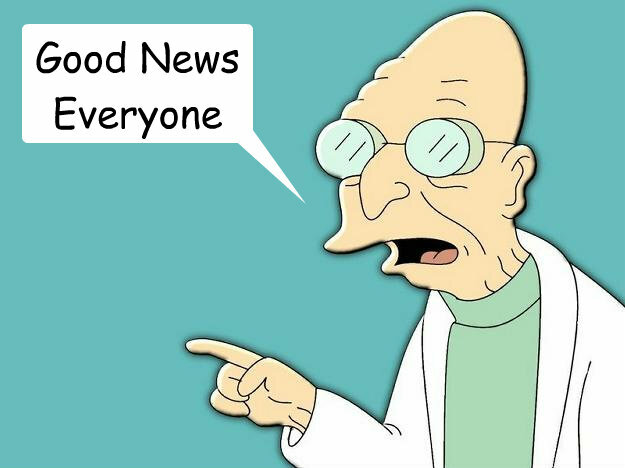 This was probably my best idea since starting this blog. Here's a view of a cheesy biscuit from a different day with less of the hard cheese on it. This is very easy to make at home. We use the Alton Brown Southern Biscuit recipe. The cheese we use is a combination of HEB Mild Longhorn cheddar and HEB Monterey Jack (both mentioned before right here in comidablog!). We buy the blocks and shred it ourselves, not that pre-shredded stuff! Give this a try and let me know how it goes for you in the comments. My calendar proudly states "Texas Monthly BBQ Festival tickets on sale today!" It's been there for weeks. I was so excited. After last year's wonderful experience with co-blogger Patty, we were ready to do it all over again. Last year tickets were $13 bucks, so this year I told my sister and a friend I'd get them their tickets for the event. This is how sad I looked. Then this morning I logged in to purchase. FIFTY EIGHT FREAKING BUCKS! Each. Ticket. Seriously. On top of that, there is a $7 processing fee - per ticket! Not to mention, parking IS NOT free at the Long Center. So, I shelled out $195 bucks. Ridiculous. They better send me home with an entire cow. I am extremely disappointed in both the Long Center and Texas Monthly for price gouging. This year's event better be 4.4 times better than last year's because that's what I am paying for. One of my friends had talked about the Lamberts brunch buffet many times before and when it came time for her birthday she decided that’s where she wanted to celebrate. I immediately searched for the menu online and began to dream about what I would eat. I planned to try as much of the food as possible – for review purposes, of course – so I went in with an empty stomach and thoughts of calorie counting pushed aside. Included in the buffet are some items – like French toast, pancakes and eggs Benedict – that you can order and do not sit on the buffet line. Our group of five ordered a few things off the menu when we first sat down including: the petite omelet, French toast, and the hangar steak eggs Benedict. We were then presented a plate of blueberry muffins, chocolate chip muffins and petite lemon scones. We all grabbed one then took a few bites and even though everyone agreed their choice was delicious, realized there was no point in wasting stomach space on bread. That was not an effective approach to buffet-ing. My usual approach to a buffet is to first get a small amount of everything I want to try, if my stomach allows, go back for seconds of the things I really like. My first plate included: potato salad, coleslaw, macaroni and cheese, poblano cheese grits, some fruit (mostly out of guilt), 2 strips of bacon, and then 1 small slice of brisket, 1 small slice of prime rib and 1 small rib (the chopping block guy kind of gave me a strange look when I asked for the smallest pieces of each). My friends all had varying approaches as seen in the accompanying pictures. My favorite things from this plate were the potato salad and mac and cheese. The potato salad was very traditional homemade style and the macaroni was thick and creamy with layers of cheese flavor (pretty sure I tasted goat cheese in there). The ribs were called “the best ribs I’ve ever had” by a friend at the other end of the table. I was not that impressed but it may have been because when I asked for a small rib, I got one from the fatty end of the slab. The small brisket piece I had was flavorful and lean. 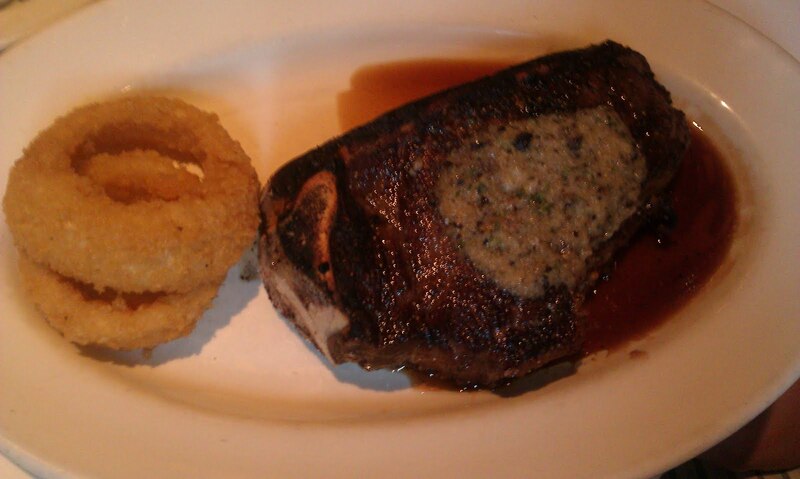 The prime rib was so tender and not as fatty as I usually expect with prime rib. The bacon was not as crispy as I usually like my bacon. The poblano grits lost in my competition of mac and cheese vs grits. They were good, but if I would only get seconds of one of the two, it would be the mac and cheese. When our ordered plates arrived I was immediately excited by the French toast. It was an inch and a half thick slice of brioche in a pool of syrup and topped with strawberry butter. I think I could have eaten the whole slice, but I cut it into pieces and shared. Everyone enjoyed the French toast. I think this was my favorite menu item of the day. The hangar steak Benedict with tobasco [how it was spelled on the menu] hollandaise was also good. My one complaint was that the English muffin was harder to slice than the actual flank steak. The hollandaise was flavorful but I am glad I ordered it on the side because too much would’ve just been well, too much. The egg was a little overcooked for traditional poached eggs but I do like my eggs medium so it worked out for me. I was able to try the petite omelet and the caramelized onions goat cheese mixture inside was scrumptious – if you like onions. For dessert they had: fried apple pies, mini red velvet cupcakes, honey pots (tiny tiny tarts filled with honey and pine nuts) and coconut cream puffs. Everyone’s favorite were the honey pots because they were something different, reminded us of Winnie the Pooh, and were yummy. The buffet is $30 a person. I think it is worth it for a special occasion. Make sure you go on a very empty stomach and with time set aside for your eventual food coma. I first have to apologize for the pictures on this post. It was dark and I have a not too fancy phone. They do not at all represent the meal. Amazing pictures (provided by the restaurant, I’m sure) can be found on the restaurant’s yelp page. 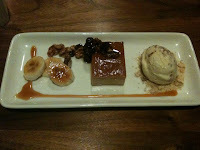 I heard about Afin Modern Japanese Tapas when a coworker checked in there on her Facebook page. I immediately googled it and found out it was a new sushi restaurant opened in north central Austin. I looked at their menu and decided it sounded like a place I would want to try. It seemed similar to the uchi/uchiko restaurants – interesting flavor combinations – but possibly a little more accessible. 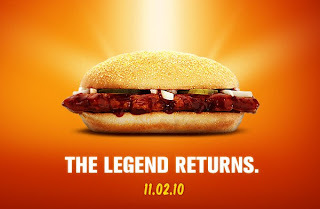 The following day the Groupon was for Afin! I instantly purchased it and was able to try it on the evening of August 5. My friend and I had $60 dollars to spend (I only spent $30 on it – hooray Groupon!) so decided to start out with the Calamari Tempura. It was drizzled with honey and sesame seeds – not too much- and was amazingly tender. 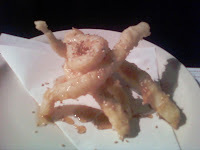 I will forever be disappointed with other places’ chewy calamari. 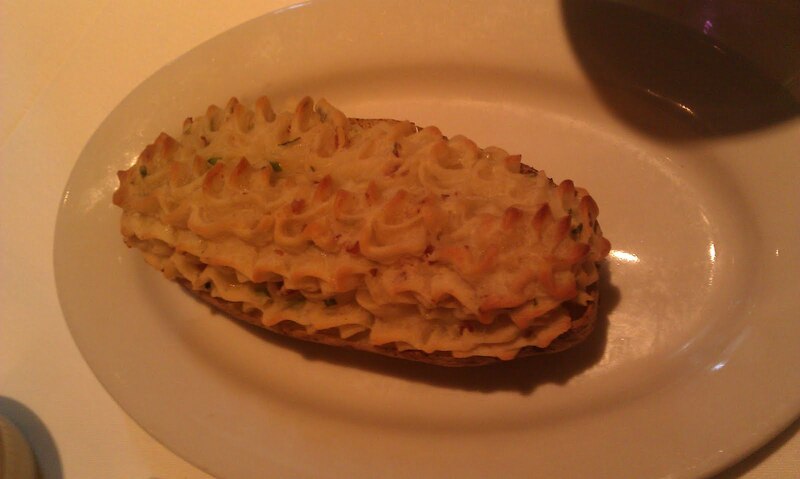 The second dish we ordered was the Karai Escloar. This was amazing. 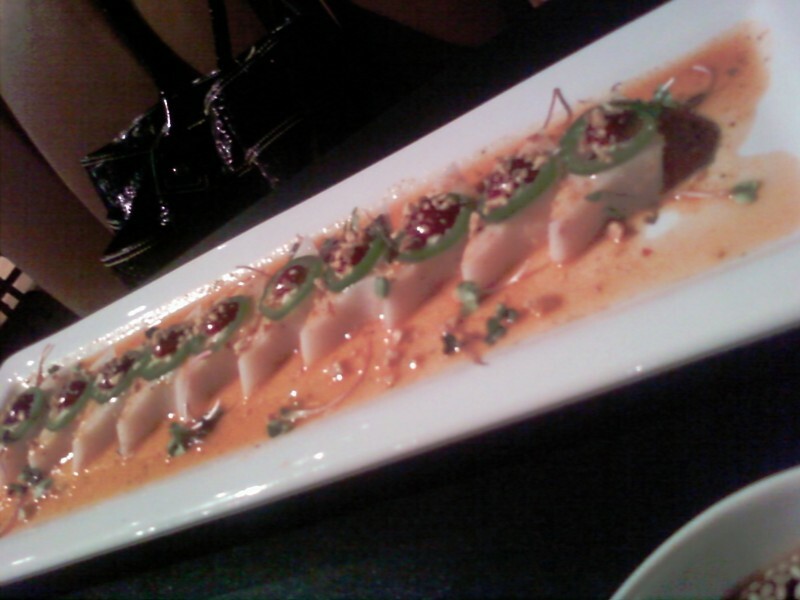 It was super white tuna sliced thin, topped with garlic chips, a dab of Sriracha (I think this is what the menu calls a Korean chile pesto), a thin slice of chile, and served in sauce that made my friend and I wish sushi restaurants had bread baskets so we could sop it up. This was my favorite dish of the night. 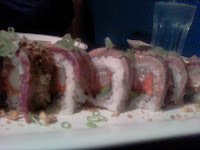 We ordered two rolls: the Choo Choo roll named after Chef Choo and the Land and Sea roll (surf and turf sushi style). 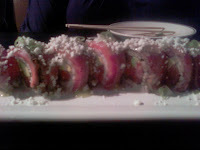 The Choo Choo roll was a spicy tuna roll with avocado and cucumber topped with seared peppered tuna, goat cheese and a honey wasabi sauce. The combination of the goat cheese and seared tuna was terrific. At first I was put off by the amount of pepper on the tuna but eventually the flavors melded. The spicy tuna in the roll was great. I normally dislike spicy tuna – something about whatever it is usually mixed with to make it spicy turns me off – but this on was a little more subtle. The Land and Sea roll was an albacore, jalapeno and avocado roll topped with seared thinly sliced filet mignon. I had to take the beef off and eat that separate from the roll because I wanted to taste everything and the roll was kind of clunky. My friend liked everything in one bite. Both rolls were delicious. We also got 4 sushi orders: sea bass, tuna, salmon belly and yellow tail [sadly, no pictures of these]. I had the tuna which was topped with a mini parmesan crisp and a tiny dollop of honey sour cream and the salmon belly which had a basil-miso vinaigrette, lemon zest and pistachio. 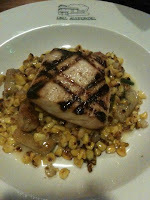 Of the two, the tuna was better but only because the accent flavors on the salmon belly were overpowering. We were both stuffed. Our tab came out to $59.00 (completely covered by the groupon, sans tip). Had I paid full price I wouldn’t have felt cheated by portions or quality. I hit a nerve with my Bert's BBQ post. Fellow Comidablogger Lils took exception to my description of ranch style beans in the black can as "horrible". I just never enjoyed the heavy chili powder taste that is apparently popular on the ranch. 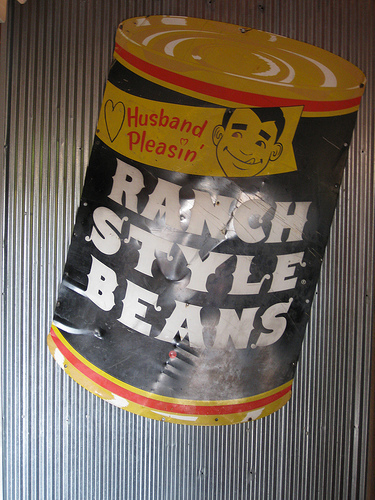 The formerly "Husband Pleasin'" beans used to be made in Fort Worth in a factory off of I-30. 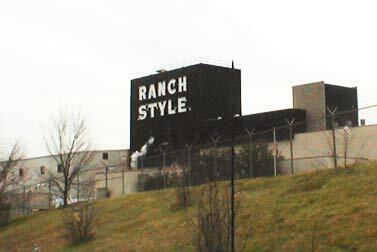 I remember passing by it on the way to Texas Rangers games and thinking of the culinary horrors that must take place there. I'll admit that I did not grow up with giant pots of fresh beans on the stove every week. My mom apparently had a low opinion of her own home made beans so we ate Gold Tip brand pinto beans from a can. Later, when Gold Tip was no longer available (went out of business? 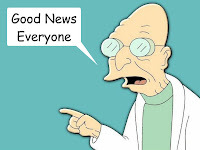 ), we switched to Bush's Best pinto beans. This today remains the standard for a quick preparation of beans at my house. They aren't as good as homemade but are very good when pressed for time. Here is a quick recipe if you just aren't up to making a pot of beans or maybe don't know how, but would like some beans with your meal. Heat beans as directed, add onions and garlic powder. Mix the onions and powder in, and let the beans simmer at medium (they might boil, that's ok). After about five minutes add the cilantro. If you want "refried" style beans use a potato masher and mash them up. Occasionally for breakfast we will add the bacon grease to the beans, but this is rare. They taste good without the bacon. I'm not saying these will win in a contest against abuela's beans, but they are an excellent quick fix. What is going on with your commercials? As if the car hops on skates weren't boring enough, you are now using these unfunny, lame, and just-plain dumb commercials. I guess you are trying to go for a crazy, funny, kooky vibe on them, but it just doesn't work. 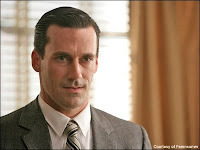 The characters are not funny and are unlikable. I especially feel contempt for the guy in the car with the cardboard robot (a total rip-off of AWESOM-O). I found an article saying you recently changed ad agencies after 17 years, and this is what they came up with (so this is what happened to your commercials). You really thought those commercials were a good idea? The people who came up with the "Pete and TJ" commercials deserve a Nobel Prize for that idea compared to what's on right now. Long live Pete and TJ! 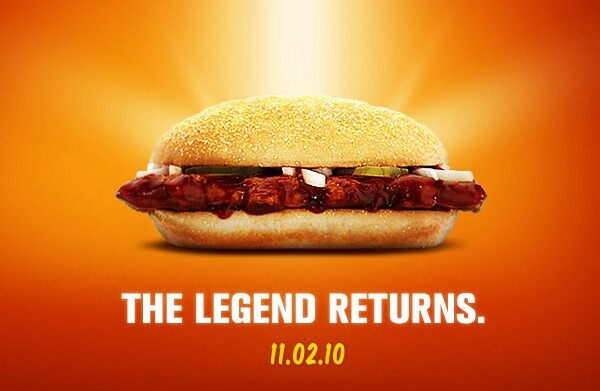 What do you think about the new Sonic commercials? Today at my local HEB I found Creamy Creations Wedding Cake ice cream -a limited edition sweet cream ice cream with strawberry and pieces of white cake swirled in. It is delicious. It got me thinking about "limited time menu items" and "special edition flavors" that get cycled around. For example, Blue Bell Ice Cream has rotating items, Whataburger cycles out it's Patty Melt and other items (like the lemon pie), and McDonald's always brings back the McRib! What is everyone's favorite seasonal/limited time item? Is there something you look forward to each year? HEB's Wedding Cake ice cream will be added to my list of things to look forward to next summer. Why don't ice cream trucks visit apartment complexes? I guess they would rather market to families with children (families with children live in apartment complexes too you know). I just think they are missing out on a giant market - singles who want ice cream delivered to them (i.e. me). What is the stereotypical food people (ok, women) are said to eat after a break up? Ice cream. What is a great snack but a lot of people don't want to keep in their freezer for fear they'll eat the entire tub? Ice cream. What is delicious? Ice cream. See! It is a genius idea. If someone makes this happen I will buy a bomb pop for you. Next season's Top Chef is apparently filming now in San Antonio, Texas! -Fill a cowboy hat with as many ingredients as you & then make a meal out of it. -Two chefs cook a meal while in a giant boot. -Cook a meal at The Rattler with rattlesnake as your main ingredient. I also hope they go to HEB and have some of the Spurs be challenge judges. That would be awesome. 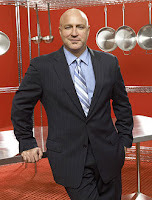 UPDATE: Apparently it's going to be TOP CHEF: TEXAS (yee-haw still works!). Rumors are they are filming in Austin and Dallas soon. I'll be hanging out at the whole foods if anyone needs to find me. I have a serious love for salad dressings. I usually don’t stray from vinaigrettes – save ranch dressing on almost every other food product except for salad and desserts – so I was really surprised when I tried out Sister’s Sesame Garlic Sass All Natural Dressing, Marinade and Sauce http://www.freshdressings.com/sesamegarlic.htm. This is actually a vinaigrette dressing (the first two ingredients are canola oil and apple cider vinegar) and is amazing! It has a different texture than a regular vinaigrette – it’s creamy but not as heavy as ranch or bleu cheese – and is a bland looking beige color. I wouldn’t have expected the rich flavor that this dressing delivers. Its ingredients are simple and it is made from “fresh, natural ingredients” right here in Austin, Texas. I love it on salad, on grilled portabella mushrooms and sautéed with green beans. I’m sure it could be used a million different ways. It’s a little pricey, but for the taste I say it's worth it! Please bring back the sun dried tomato balsamic vinaigrette. 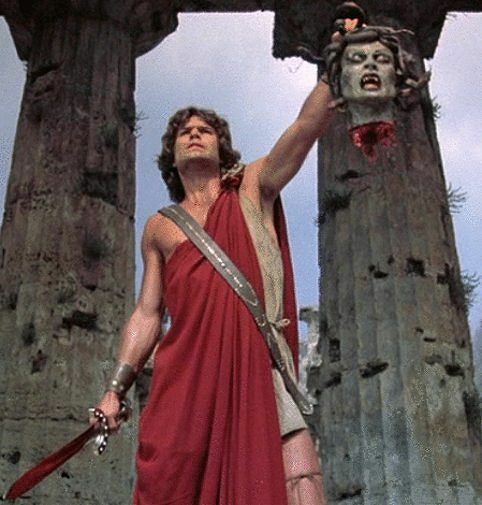 It was one of the best things on your menu. I'd appreciate it. This picture is about five and a half years old, so I doubt this is still on the menu. I love this unnamed taco restaurant, but there was one thing I never ordered...ever. A Modest Proposal for lunch? I am a huge fan of happy hour - not only because I enjoy spending time with my friends when alcohol is on sale - but because food is usually on sale too. There are so many great happy hour specials around Austin I decided I need partake in happy hour more often. Today, like many other Americans I was off for Memorial Day. I got hungry around 5 and texted some friends to see if anyone was out and wanted to meet up for lunch. Everyone was either on the other side of town or lounging on their couch. I remembered thinking I had seen that Mandola's had some good specials from 3-6pm Monday-Friday and decided to venture out alone and check it out. Beer (tap and bottle) is $2.00 off, frozen drinks are $3.50, and glasses, quartinos and carafes of wine are all half off. They provide focaccia bread and olive oil to each table. I got a glass of wine (it was a Jules Cobb style pour - but it was a small glass) and the above pizza for ten bucks and change. I was so stuffed from the bread that I had more than enough pizza left for at least another meal. This place is much more low-key than a lot of the loud hot spots for happy hour - you know, the ones you can't find parking at - and is highly recommended if you want to catch up with friends by actually having a conversation. Now mind you this was just a review of their great happy hour specials - I guess I'll have to go back and enjoy dinner from their full menu at a later time. I made carne guisada for the first time several weeks ago. It turned out good, but it didn't have enough gravy. I cobbled together a recipe from a book and the one my wife uses along with her notes. On our last two pots of carne guisada we've used prime top round from HEB. Although it is prime it has only been about $6 per lb (since it's top round) and has been very good. The extra marbling has made a big difference in flavor and tenderness. The other was from "The Tex-Mex Cookbook" by Robb Walsh. The ingredients and instructions were basically the same, but as previously noted I should have used more water/beef broth to make more gravy. I also used tomato sauce instead of of whole or fresh tomatos because I think the sauce comes out heartier. We like onions and garlic so I used six cloves of garlic and one half of a large onion. We also do not use bell pepper in our cooking. The book recipe adds potatoes, but since this isn't picadillo, that was never even considered. The cooks.com recipe says to simmer for 45 minutes and the book says one hour. I left the carne guisada simmering for about an hour and a half. With the right pot you won't lose much moisture which means you could basically simmer even longer if desired, or if you aren't really hungry and ready to eat. Pan used: Stainless steel 3 Qt. saute pan. Recipe changes: Additional garlic, additional onions, no bell pepper, no potatoes, replaced half of water with beef broth. 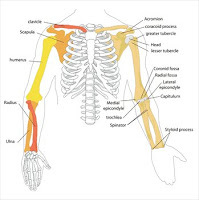 That's the size of my radius or ulna! It was 100% meaty goodness, juicy and tender and just the right amount of fat to make it buttery melt-a-licious. Me, I had a tiny little filet. 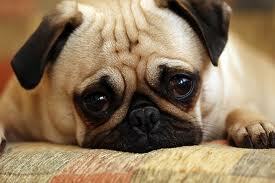 Again, sadness. For dessert, Gibson's is RIDDIKULUS. They bring out cakes and pies the size of one's head. I saw everyone taking their dessert home, which begs the question? Why the waste? To be honest, the desserts aren't very good. I'm not really into "Excess as Dessert," but maybe it's your cup o' tea. 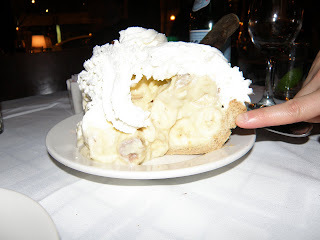 We ordered the banana creme pie and it was of course too big for us to finish. Last night we had some friends and town and re-visited our steakhouse choice when we rang in 2010: the Chicago Firehouse. This place does not disappoint. They have the best crab cakes I've had at a steakhouse...crispy crust but soft, fresh tasting crab. 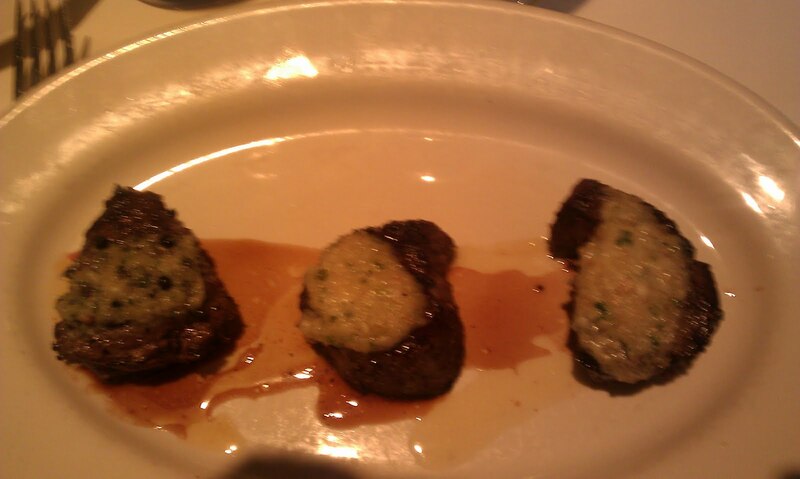 I had a filet flight - I love not having to make up my mind and appreciate when restaurants offer things like this. I got to taste the parmesan crust, horseradish crust and bleu cheese crust. My clear favorite was the bleu cheese. 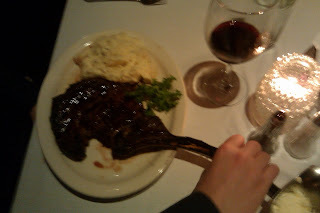 The bf tried the Kansas City cut - less fat than a rib-eye but touted as equally flavorful. He chowed it down so I'm sure it lived up to the expectations. He didn't share, so I can' t confirm. 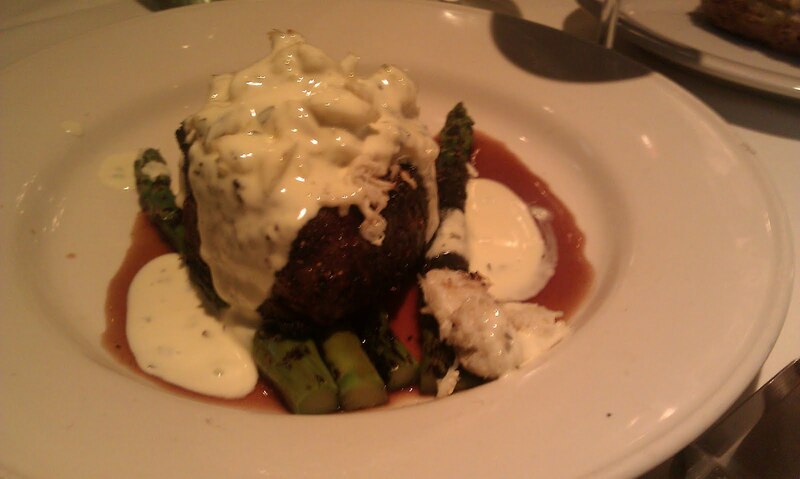 Our friends ordered a bone-in filet (so tender that the only complaint was it wasn't enough) and the Filet Oscar with a crabmeat crust (why is this called Oscar?). Pictures below! Finally, I tried a Moscow Mule! I found it refreshing and delicious and would love to make it my new cocktail that I order at a bar, but I doubt your average bar has ginger beer on stock.